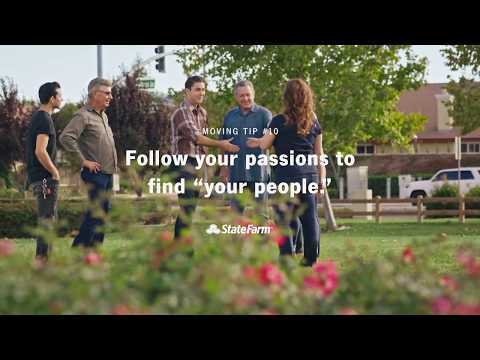 State Farm® understands moving to a new community isn't always easy, and we’re here to help with moving tips from State Farm Agent Jose Martinez. Jose immigrated to Brentwood, California from Mexico 50 years ago, so he knows a thing or two about making a new community feel like home—like doing the things you love. We introduced Jose to new Brentwood resident Gabriel, so Jose could share his story, and his wisdom, with a new neighbor. Whether it’s extreme paragliding or hand knitting scarves, we all have interests and passions that make us who we are. And in today’s world, it’s easier than ever to connect with people who are passionate about the same things. What better way to connect with your community than to find people who love the same things you do? Where do I find people that are like me? There’s an app for that. Apps like Meetup, Nextdoor, Skout and Nearify offer awesome ways to connect with likeminded people and make new friends. Get social. Look for local groups you’re interested in on Facebook or Twitter. Or start your own group! Go out on the town. Love to read? Hang out at the library. Love to rock out? Go see live music. Love antiquing? Go to a local thrift shop. Find the places you enjoy in your community, and you’ll meet people who are into the same things as you. Organize a neighborhood event. Pick a hobby you love or that you’ve been wanting to get into, and host an event for your new neighbors. Maybe it’s a group craft project, a potluck for foodies or a neighborhood bocce ball tournament. You might introduce people to something they end up loving too. What it really comes down to is, just find your passion. Do that, and you’ll find the right people to be part of your life. Look beyond your own block with these ways to show you care. Get out of town. You'll love what you find. Every area has a local culture waiting to be explored. New to the neighborhood? Stick with the locals, they know a thing or two.